Given by Charlotte Barker, daughter of the late Ronald Barker OBE. Variety Club of Great Britain award for Joint Show Business Personailty of 1980, awarded to Ronnie Barker, OBE. 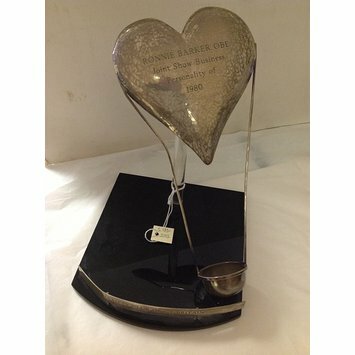 The award features an inscribed silver heart with a gondola hanging from it, mounted on a perspex base. The inscription reads ' RONNIE BARKER, OBE / Joint Show Business / Personality of / 1980'. A silver heart inscribed with the details of the award, with a silver gondola hanging from it, mounted on a perspex base and with an inscribed silver label in the front. Awarded to Ronnie Barker by the Variety Club of Great Britain in 1980. 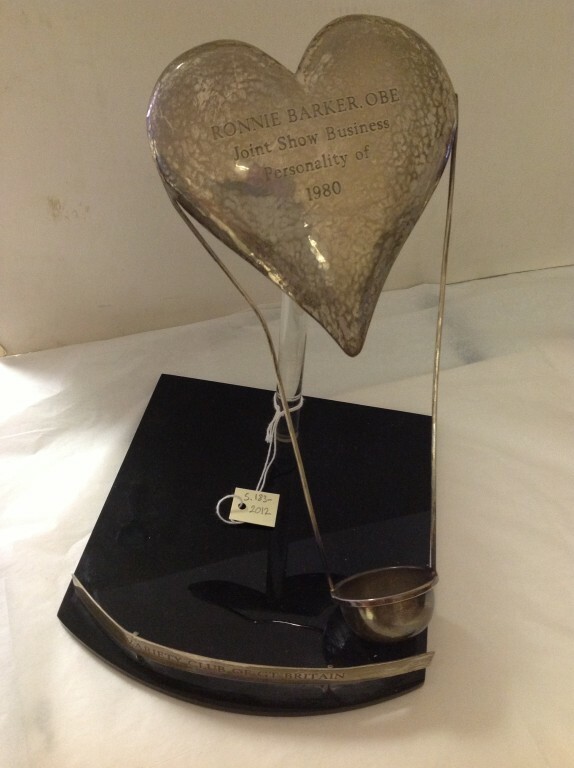 Variety Club of Great Britain award for Joint Show Business Personality of 1980, awarded to Ronnie Barker OBE. Features a silver heart with a gondola hanging from it, mounted on a perspex stand and with a silver label.